Update 13 July 2013: After the deprecation of the Strava API, this tool no longer works. However, an updated version of this segment gradient tool is now available here. So this tool plots elevation profiles from Strava data. OK, so maybe the profiles aren’t amazingly pretty. But I had fun making them look somewhat like the elevation profiles from a certain famous cycling event! I wrote the code to fulfill a specific purpose: generating graphs for the Hobart 10,000 ride. But I figured I’d make the code and tool available for anyone to use or fiddle with as they see fit. This tool requires IE9, Firefox, Safari, Chrome or any other canvas-aware browser. If you plug in bad data, you’ll get bad results. So don’t. All the parameters dynamically refresh the profile, except for the segment ID field, after which you’ll need to click Load Segment. Updated 15 Aug 2012: The tool now does isometric projection, which I think looks quite a lot nicer, and I’ve tidied up the user interface and added a few more controls. As noted by Jonathan in the comments, it doesn’t do too well with downhill segments — the tool assumes it is an uphill segment at present. I’m not sure which hurt more: the race, or the ride back. I know which hurt longer. Today was the day of the Longford – Campbell Town race, which was the first bike race I ever entered last year. The day dawned fine, with the hint of rain on the horizon. I woke early as I have been doing recently, but tiptoed out of bed and quietly ate two big bowls of muesli. Now happily and heavily bloated, I checked all my gear, and double checked. Figured if I had my helmet and my shoes I’d be ok. It was still early, so I drove to Salamanca and had a coffee, read the paper, before I headed over to pick up Barry who would be racing with me today. Barry was recovering from a nasty cold and had a bung knee, and just wanted to race for the fun of it, without real expectations of great results. The 180km drive to Longford was uneventful, except that the hint of rain turned into real rain as we drove through the Midlands — both of us fervently hoping it would clear well before 1pm so we’d be able to race on dry roads. Happily, it did. The sky cleared up, the roads dried up, and the temperature was about 18 degrees. Perfect. Except for the wind. When we arrived in Longford to get ourselves organised, at about 11am, the wind was a NNW at about 30km/h. Not too gusty but still pretty strong. We put our bikes together, pumped our tyres, checked various bits and bobs, ate some more, and headed out for a 4km warmup. I felt like I was in great form as we headed down the road towards Campbell Town on the warmup, feet and heart barely ticking over and sitting on 40 km/h. Then we turned to ride back to the start line and I realised it was all down to the wind. Barry chose the wrong wheels for the day! As I hadn’t raced for quite some time, I asked the handicapper to help me select a grade. “What grade do you ride in Hobart?” he asked. “B”. “Ok, that’ll be D grade here.” OK… I guess? I went back to the registration desk and told them that Phil has put me in D grade. “They won’t need transponders, will they?” one of the people at the desk asked the other as Barry and I gave our details. Great, so the assumption is that we won’t even get a placing. Way to put my ego back into the box! Good for me. I’d say it lit a fire in my belly, except it didn’t. There were two important pieces of information given at the pre-race briefing: first, that we’d have to walk across a wooden bridge in order to prevent accidents, and second, that riders caught on the wrong side of the road would be fined, disqualified and potentially even banned. Apparently, over the previous races, there were a number of cars forced off the road by racers taking risky tactics. I’ve never been one to spend much time on the wrong side of the road, so I wasn’t too bothered by this information. E grade took off, with my mate Rob and 20 others, and it was a five minute wait for D grade. Then we started, and the shock of race pace set in. 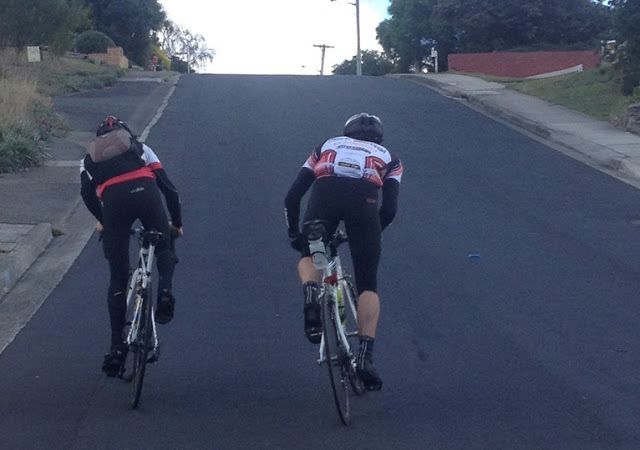 It wasn’t excruciating, like last year’s B grade start, but we weren’t standing around. Some sort of organisation of the bunch started, with the front half of the bunch swapping turns on the front, but it was never very tidy. Along this section, I was working hard but never really in danger of being dropped. The wind was alternately a tail wind and a cross tail wind. In the first cross wind section, the bunch split and I made the front selection, riding in the gutter in about 8th position. I wasn’t very comfortable there and made an effort to form a second echelon, which actually felt easier than trying to focus on riding on the edge of the road with the wind trying to blow me off. When we arrived at the bridge, I was feeling comfortable and made sure I was at the very front of the group before dismounting to avoid nasty surprises at the other end of the bridge! After the bridge, I was on the front, and the bunch seemed to lose interest in moving quickly, and I soon found myself about 100m off the front of the bunch. I wasn’t prepared to try and ride the next 40km solo, so I didn’t put an effort in to establish a real gap, and instead just focused on riding smoothly and consistently. A couple of minutes later, the bunch closed up the gap and I happily rejoined them. Each time the road turned a corner and put us into a different wind, a few more riders would disappear until I realised that there were only 4 of us left. I was starting to feel tired, and I knew I needed to eat something. It took me probably 5 minutes before I turned that knowledge into action, and in that time, the other three riders went up the road, and I was on my own! I caught the next D grade rider (I was passing E grade riders regularly at this point) just before the road made a sharp turn east on the final 15km into Campbell Town. As we swung around the corner, the road got very bumpy. And the wind was, for the first time, on the front quarter and not the back quarter. My speed dropped from 50km/h to under 30km/h, and I was working hard. We worked together for a while, along with my mate Rob who we caught on this section, as we approached the one small climb in the race, and as we went over the top of the climb I looked back and saw a bunch approaching. A grade. A minute later and they swept past us, and I was able to jump into the front half of the bunch. Exhilerating feeling! I was now sitting on 60km/h and it wasn’t really hurting. I didn’t try to take a turn on the front but anxiously checked the numbers on the other riders in this fast moving bunch. No other D graders — I was happy! Only one thing annoyed me — this bunch persisted on riding on the wrong side of the road! Yes, we passed a couple of other riders, but it wasn’t necessary. I didn’t contest the sprint, happy to roll over the line in the back of the bunch. Second place in D grade. My first ever podium finish! I had to notify the race volunteers that I’d finished with a placing as I had no transponder… Cloud nine time: my fastest ever 60km; I rode the race at a 45km/h average speed! I’d won something! Some cash! It turns out the first place D grade rider, Glenn Myler, took out the whole race, having caught all of E grade. Kudos to him — his first ever 1st place finish and he was pretty happy. Barry was content just to finish, I think, with his head cold and bung knee. Then Barry and I had to ride back to the car. The wind was a little stronger, the gusts a little more pronounced. And we were riding right into it, for the whole 60km. We averaged a measly 23.5km/h on the return trip. A couple of other riders came back with us, one of them bonking badly. He’d had two Weetbix for breakfast — that’s all. Sounds like what I did for the Grindelwald Challenge! It was painfully slow and not helped by other cyclists going back in cars and giving us “helpful” comments out the window as they went past! It took forever, but we finally rolled into Longford. All in all, a satisfying day! Big thanks to Barry for the great company and to Iain for lending me some lighter wheels.